Even though it’s still a bit cold, now is the perfect time to prune woody plants if they bloom in summer. Some examples are burning bush, hydrangeas, clethra, barberry, St. John’s wort, and weigela. Wait to prune your fragrant viburnums, lilacs, and anything that blooms before Memorial Day until just after they flower. These plants already have flower buds ready to go for spring. Only prune if necessary to control the size of the plant or to remove dead, crossing or damaged twigs. Opening up the canopy of a tree or the structure of shrubs will allow greater air circulation and reduce fungal disease. Pruning now before leaves appear allows you to clearly see the structure of the plant. Don’t wait too much longer than March 20th to prune oaks and elms. Oaks and elms should only be pruned while insects are still dormant to prevent the spread of Dutch Elm Disease and oak wilt. Prune birch and maple early too, as pruning cuts may weep excessively once sap begins to flow. It won’t hurt the tree, but it can be unsightly. 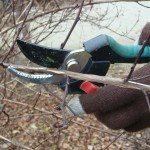 Consider attending a free ‘Hands on Pruning’ seminar at The Growing Place in Aurora during our Opening Weekend March 29 and 30 to learn more about pruning and practice techniques.